The novel is set in two neighboring fictional countries: To the south lies Ancelstierre, which has a technology level and society similar to that of early-20th century England, and to the north lies the Old Kingdom, where magic works and dangerous spirits roam the land – a fact officially denied by the government of Ancelstierre and disbelieved by most of Ancelstierre’s inhabitants. (Those who live near the border know the truth of it, especially on days when the wind is blowing out of the Old Kingdom.) These dangerous spirits range from undead corpses known as Dead Hands to supernatural beings known as Free Magic elementals. These living Dead are raised by Necromancers, or black magicians, who roam the Old Kingdom or live in Death, using Hands to do their bidding. To remedy the problem of dangerous, living dead, there is always a sorcerer with the title of Abhorsen, who is essentially a Necromancer himself (or herself), only in the reverse; he puts the dead to rest. 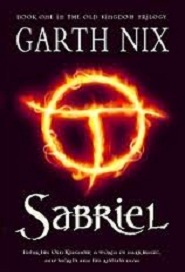 At the time of Sabriel, it is her father, Terciel, who has the job of controlling the endless dead creatures doing evil deeds around the Wall, especially difficult since a new evil seems to be rising. Sabriel is joined on her journey back to the Old Kingdom by an ancient Free Magic construct of unknown origin named Mogget. Mogget appears in the form of a white cat and is bound by a red Charter magic collar to serve the Abhorsen. Sabriel is told never to release Mogget’s collar. Sabriel and Mogget take a craft known as a Paperwing to try to find her father. On the way, they are attacked by the Dead. The craft is wrecked, and in order to save herself, Sabriel releases Mogget. The cat reveals himself to be an incredibly powerful Free Magic elemental. It almost kills Sabriel, but she rebinds him with a ring she received from him a few hours before for just such a purpose.